The Fair Access to Insurance Requirements (FAIR) Plan is a state-mandated program that provides fair access to insurance for individuals who are having trouble insuring their property due to the fact that insurers consider them high risk. The FAIR plan is a "shared market plan." FAIR Plans are state programs sometimes subsidized by private insurance companies. These plans often provide insurance to people that would otherwise be denied insurance on their property due to a high-risk area or other related high-risk problems. Your state insurance department can give you more information on it's particular FAIR Plan or you can check out the state by state list of where you can get help for the FAIR Plan insurance program below. "loss history" or having a high number of claims incidents for the location or specific home. Where Do You Get Insurance for a "High Insurance Risk" Area? Standard insurers do not specialize in high-risk properties and therefore will often refuse to insure them, by either not insuring them at all, or by deciding that they will not renew a high-risk location once the insurance policy term is up. What Makes a Home High-Risk? If you are purchasing your first home or a new property and are having a hard time finding an insurance company to insure you, try asking your realtor if they know of insurance companies or brokers in your area that will write policies in the area. Insurance brokers have access to many different insurance companies and will work to find you something. You can also contact your local State Insurance Commissioner's Office and they will point you in the right direction. You may still be able to find a policy with a private insurer that is comfortable and offers good coverage. The FAIR Plan should be used as a last resort. You can also try to negotiate: Consider the reasons that you are being refused insurance and try negotiating with the insurance company. Very often if you make adjustments or repairs, or consider higher deductibles, you may be able to obtain coverage. Make sure you try everything with a few standard insurers before going to the FAIR Plan. If you have exhausted all the options outlined above, and you can't seem to find an insurance company to accept your risk, then you have the option of applying for insurance with the FAIR Plan. Keep in mind, however, if the reason for a refusal to insure your property is not due to matters beyond your control, even the FAIR Plan has the right to refuse coverage if you do not adhere to their recommendations. The situation varies case by case, so the best idea is to contact them directly to discuss the conditions of the FAIR Plan as they apply to your situation. You may also be eligible for additional insurance endorsements that may improve the base coverage. 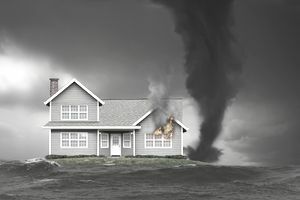 If you have been unsuccessful in obtaining insurance for your home because it is designated as a high risk or you have been refused insurance, and you have already tried to negotiate with standard private insurers and exhausted all other options, then you can contact the FAIR Plan administrator in your state to find out more information about the FAIR plan and how to get insurance on your home.